Also known as El Moro Canyon in northern Laguna Beach. The park is almost entirely fireroad with a few good singletrack exceptions. The park landscape differs from that of almost any other park in OC. It is mostly open grassland and open hills with minimal trees. Directions: El Morro Canyon is located on Pacific Coast Highway between Laguna Beach and Corona Del Mar. Park in the State Park parking lot and make sure to bring a crisp $5 bill for the parking machine. Parking tickets are no joke to the rangers. Swimming, surfing, skin diving and paddle boarding all take place in the waters off Aliso. Also enjoy fishing, sunbathing, tidepool exploration and sand castle building. A concession building offers fishing gear rental and sales, food and beverages, and beach supplies. Emerald Bay Canyon, Laguna Coast Wilderness Park to Santa Catalina Island. 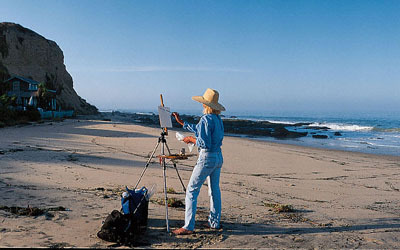 Laguna Coast Wilderness Park and Crystal Cove State park are at the center of this 17,000 acres of coastal wilderness. This area surrounding Laguna Beach provides open space, community parks and marine preserves. Activities include hiking, cycling, horseback riding, bird-watching, and nature study.